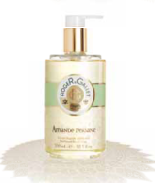 For over two centuries Roger & Gallet have been synonymous with the art of traditional perfumer-apothecary fragrance. With rare natural essences and quality materials, they create scents and body products to offer a natural and indulgent touch of happiness every day. In the creation of each fragrance, the connection between scent and mood is kept in mind. The power of Aromachology is such that the products are not simply beneficial for the skin, but are also a pleasurable experience for the mind and the senses. However you’re feeling, Roger & Gallet has a scent to match; with the sensuality of Ginger, the energy of Citron, the serenity of Green Tea, the romanticism of Rose and the relaxation of Lavande Royale to soothe and stimulate the senses. A light and fresh blend of almond, mandarin and cedar essential oils to restore a sense of well being. The uplifting spritz will transport you to the abundant gardens of Persia, with a fresh and citrussy top, and a sensual almond and tonka infused heart and base. A great daily refresher to lift your spirits. Made from an 100% pure plant oil base in the traditional “cauldron” method, the creamy and soft Amande Persane soaps are infused with essential oils right through to its heart. 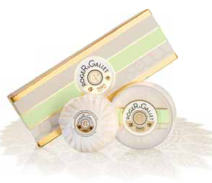 The gentle and high quality soaps are wrapped in pleated silk paper for a touch of indulgence. Formulated from a pure plant base and further enriched with Aloe Vera, the Amande Persane liquid soap is created with the same traditional “cauldron” method as the round soaps. The formulation is so gentle that is can be used on the most sensitive skin, both for the body and the hands. With extracts of clarifying pomegranate, and a comforting blend of nourishing almond oil and limestone ions, this creamy and enveloping lather leaves skin feeling supple, soft and regenerated. The gentle cleanser is suitable for even the most sensitive skin types, and delicately fragrances the skin for a feeling of optimal comfort and wellbeing. For the most comfortable moisturising experience possible, the Amande Persane body milk is formulated with nourishing almond milk and pro-vitamin B5. The soothing formulation melts into the skin immediately, leaving it feeling supple, smooth and silky. Envelopes the body in a fragranced veil that is suitable for even the most sensitive of skins. 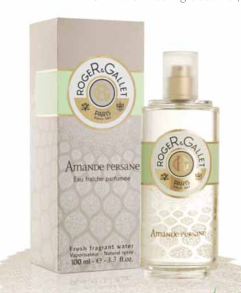 View the entire Roger & Gallet Amande Persane range. I love the the Amande Persane range - I adore the bitter almond fragrance - and wish so much it had a bit more longevity. So I tried to layer, with the soap, shower/bath gel, body lotion and fragrance. Still not enough legs! I still love it though. This body lotion is lovely, with a great consistency that spreads easily and sinks in fast, and oh! that almond fragrance! Lovely. A little goes a long way - I'm not mean with it though - so the tube lasts fr ages. This entry was posted on Wednesday, October 27th, 2010 at 12:00 pm and is filed under Bath & Shower, Fragrance, Offers. You can follow any responses to this entry through the RSS 2.0 feed. You can skip to the end and leave a response. Pinging is currently not allowed.